4M Plants ATY machines are built with fully independent positions in order to grant you the opportunity to produce different counts on different positions in the same time. 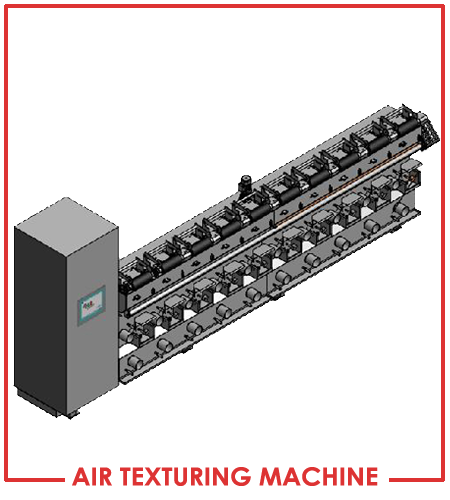 This machine is designed for air texturing process of PP FDY continuous filament yarn up to 3.500 dtex final for single position, parallel or core/effect yarn (optional) wound on cylindrical bobbins. The unit can also be used for rewinding or air-tangling yarn adding air-tangling ceramics. Count From 150 Dtex up to max 3.500 Dtex depending on ceramics installed. Production capacity about 1.5 kg/hour per position depending on count and speed.